I’m sending out a list of five curiosities every Friday. You can sign up, for free, at Puzzlements.co! School is often, quite strangely, not a place where students feel comfortable being curious. But you can change that with a determined and consistent effort. 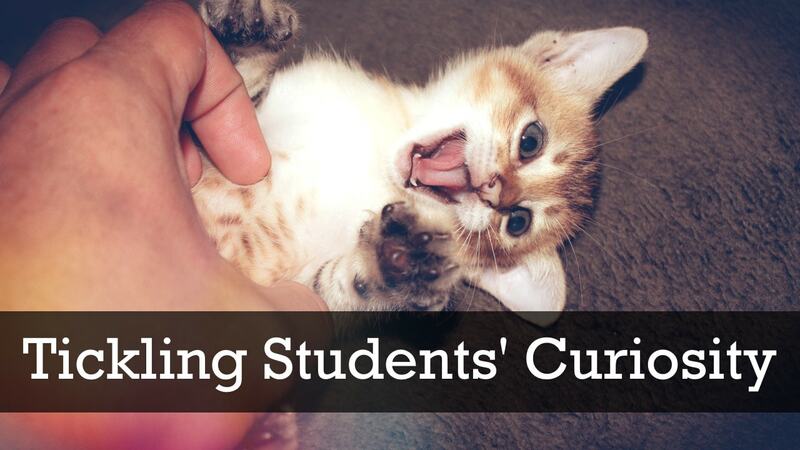 I knew that my students were incredibly curious, but if I asked them, “Hey, what are you interested in? What do you have questions about?” they just blinked at me in confusion. Let’s intentionally promote curiosity as a classroom habit. 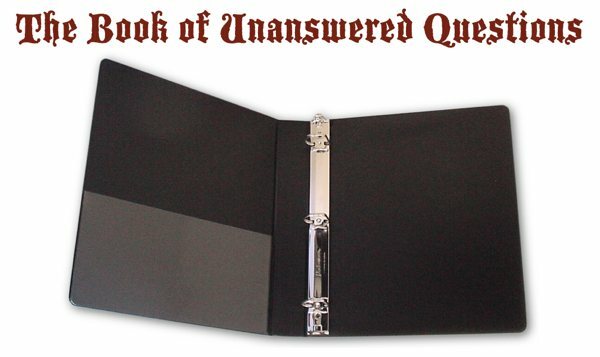 Create a Book of Unanswered Questions. This can be as simple as a binder filled with blank pages. We’re going to encourage students to write questions in here, whether random and off-topic, or directly related to curriculum. But, if you just say, “Write your questions in this book,” it’s dead in the water. Like anything complex, we’ve got to scaffold it through modeling and structured participation. Start by demonstrating curiosity. Bring in an image, video, song, or object that truly interests you. Have some authentic questions ready. Here’s a video you might use to tickle your kids’ curiosity. Kina Grannis – In Your Arms from Greg Jardin on Vimeo. What else has director created? I really liked his style. I wondered what tools were used to make this video. Then give them a chance: did you guys have any questions? Write all questions into The Book of Unanswered Questions. Now, don’t ask them to look for the answers. Let’s see if anyone satisfies their curiosity on their own. In the morning, ask if anyone learned how long it took to make the video. I’ll bet at least one person went home and did some research. The others will say, “Oh yeah, I forgot about that.” But they’ll see that you care a bit about asking and answering questions. It took more than a year (and she had to wear the same outfit). Wow! The director also made this commercial and this music video, both of which are also stop motion. They used a regular old laptop, a digital camera, and a spare bedroom. Now write the answers into The Book of Unanswered Questions. Isn’t this weird? I wondered: Where is this? What shaped this wall? When was this picture taken? What questions do you guys have about this? Again, don’t remind them about it at the end of the day, but see if anyone remembers tomorrow. 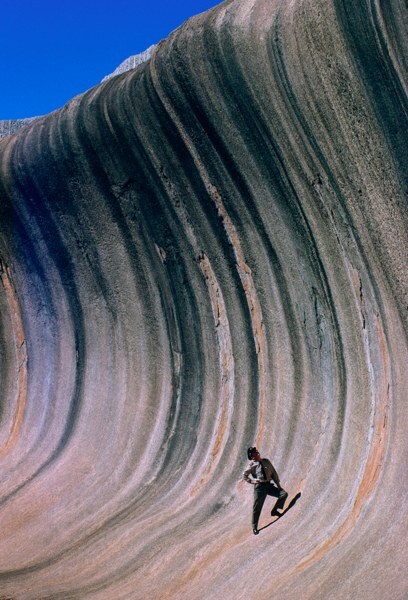 You guessed it, see if anyone found information about the image of the Australian rock from 1963. Write them into the book. If not, that’s fine. The book is supposed to be filled with unanswered questions. Share a third curiosity tickler. If you need inspiration, here are some awesome hot air balloons, here’s a mantis that looks like an orchid, and here are surreal images built up from multiple photos. Encourage specific questions. And the questions can be about anything! In the balloon image, maybe kids are interested in how hot air balloons stay afloat or maybe they’re interested in the structures. Let their curiosity roam freely (and keep encouraging this with your own questions). On Thursday, instead of sharing your own cool thing, tell your students, “Hey, if you see anything cool on the internet tonight, shoot me an email (my upper grade bias is coming through here)”. This lets you preview it and possibly figure out how to get around the dreaded district network filter. Remind them when they leave to keep their eye out for something interesting online. Even if you only get one example of a curiosity tickler: show it on Friday morning. Let your kids ask questions and, of course, write them in the book. Now, set up a repeating schedule for this activity. Pick a day (not Monday!) where you schedule five minutes for sharing a cool thing. Yes, it’s a bit like Show-And-Tell, but keep the focus on objects or images that inspire curiosity. If it’s very successful, you might need to start a calendar so kids can sign up in advance. If it’s very unpopular, you might have to keep sharing your own cool things for a while. Keep that book updated, too! Now, start connecting The Book Of Unanswered Questions to your curriculum. Did you just finish learning about Abe Lincoln? Ask your kids what they still don’t know about him. Done with the unit on Ancient Egypt? What didn’t we learn. Finished the water cycle? How would it work with less gravity? More gravity? Freezing temperatures? Keep asking your students! Ask them everyday! Write their questions in The Book Of Unanswered Questions. After a few weeks, take a trip back in time and remind students that no one figured out where that mantis that looks like an orchid lives. Use the book to keep your students pondering their own unanswered questions. Eventually, you can use it to fuel curiosity based research. I’ve created Puzzlements.co to share weekly collections of these curiosity ticklers. Sign up for free. 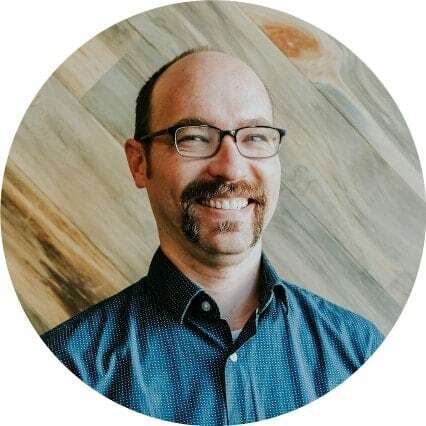 Check Dan Meyer’s “show and tell” category. This one is particularly striking. Sharing intriguing links is my main use of Twitter. Follow me there. Jason Kottke’s website is a treasure trove of fascinating clips, articles, and images. Jim Coudal keeps a constant flood of interesting links flowing (if anything, there’s too much). Google Earth Pics is an awesome Twitter account that simply shares amazing pictures.